In this last year of the Indian Springs Project, we want to have more urban conservation practices installed. This is a unique watershed project because it has funding for both urban and agricultural conservation practices. The urban practices we are providing cost-share on are rain barrels and rain gardens. Two of the main ideas in urban conservation are infiltration and detention. Infiltration occurs when water is absorbed into the soil rather than running off the surface. In urban areas, we have a lot of impervious (hard) surfaces like roofs, driveways, and roads. These surfaces cause water to run off rather than infiltrate into soil. Several urban conservation practices focus on increasing the amount of water that infiltrates into the soil rather than running off the surface. Detention focuses on holding water from rain storms temporarily until it can be used/infiltrated. 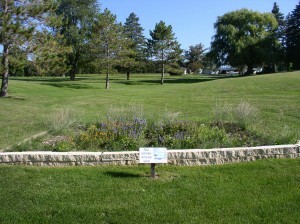 Rain garden in Waukon City Park. Rain Gardens: Improving water quality through gardening. Rain gardens are gardens planted in depressions (areas that are lower than the surrounding land). They capture runoff water and infiltrate it. They are usually planted with perennial vegetation (plants that live for many years) so that they are lower maintenance long-term. They are designed to temporarily pond the water and infiltrate it within 24 hours. They are not wetlands or swamps, so they should not attract mosquitoes. They are beautiful and useful additions to a lawn. By reducing the amount of water that runs off of a yard, rain gardens help to reduce the amount of urban pollutants such as fertilizers, oil, pet waste, and sediment carried to water bodies like streams, river, and lakes. Rain barrel installed in the watershed. Rain Barrels: More than a drop in the bucket. 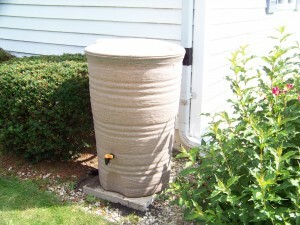 Rain barrels are simply barrels that collect rain water from downspouts. They are a simple and useful practice. They help reduce the amount of water that runs off of impervious surfaces like driveways, sidewalks, and roads during storms. This water can be used for watering lawns and plants to washing cars to flushing toilets but should not be used for drinking. Although one rain barrel may not have much impact on water quality and quantity in the watershed, they are a first step in urban conservation. They also help us to realize how much water runs off of our roofs. During big rain storms, rain barrels fill up quickly, so we can better understand how much water runs off of surfaces that could be captured and used later. Two or more barrels can also be connected to be able to capture more water at one time. They help to reduce water bills and also provide chlorine-free water for your lawn and garden. If you live in the Indian Springs Pond Watershed and have any interest in either of these practices, please contact us at (563)-568-2246 ext. 3, email at sara.berges@ia.nacdnet.net, or stop in to the office at 635 9th St NW, Waukon, Iowa.